Have you tried to break your drug or alcohol addiction, and nothing is working? Have you done what you could on your own, and even sought outside help, only to discover that you keep falling back into the same old patterns? Have you started to give up hope that true recovery is even possible? If you have tried to stay sober and live free of your addiction, but just haven’t figured it out, inpatient substance abuse treatment may be for you. This is a strategy that removes you from your typical surroundings and gives you a protected environment, strategic counseling, and a new start. These things can all make a difference in making sure that your addiction rehab really works, and that’s why Eternal Awakenings (EA) offers a residential treatment program here in Gonzales, Texas. However, not all of these programs are created equal. 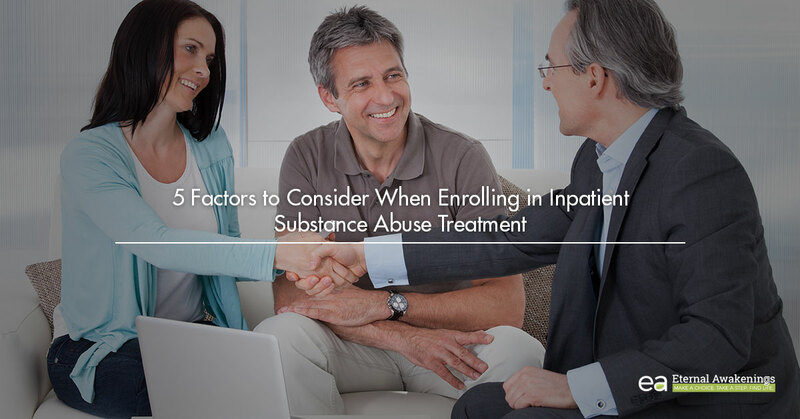 Here are some of the things that we’d recommend you keep in mind when considering enrolling in any kind of inpatient or residential substance abuse treatment. It’s important to know upfront what the intake process is for any program that you’re considering. Otherwise, you might be making arrangements to attend, only to find out that they have an intake process that doesn’t fit you or your schedule (for instance, a waiting list or specific qualifications that residents have to meet). It’s easy to find out more information. You can simply pick up the phone and call most programs and someone will be glad to answer your questions. To call EA, please dial 888-672-0298. It’s inevitable that programs like these will have rules, but you have a right to know upfront what the rules are, and you should carefully consider whether you can abide by the center’s rules during your stay there. You’ll typically encounter rules about things like cell phone use, when you can and can’t leave the grounds of the organization, items that are forbidden or contraband, mixed-gender interaction, and when your friends and family can come to visit. Some places are much stricter than others, and you should be comfortable with the rules that are in place and know that there is a beneficial purpose for them. If a rule seems extremely arbitrary (say, a particular dress code rule, like one that says, “you can’t have any writing on your shirt”), ask about it and watch the reaction of the staff when they answer you. If they can’t give any reasonable grounds for it, then it’s probably something that made it into the handbook after one person made a bad decision one time and they banned that action for all time. You’re making a drastic change in your life in order to put everything on hold for a season and attend residential treatment. Therefore, you should be able to have a reasonable certainty that the program is run well, is well organized, and has a good track record of success. No addiction recovery program will ever have a 100% success rate, but the organization that you attend should at least be able to point to the success stories of their graduates and share with you why the program will work for you. You can also ask questions like these to learn more about the treatment. What sets their treatment apart? What kind of daily schedule will you have? Are they going to be sharing shallow information that everyone knows, or do they have a depth of knowledge, wisdom, and insight to share with you? Will your activities be time-fillers, or will every day be full of things designed to benefit you and build you up for lasting success? In general, programs that have more extensive experience and a longer track record will typically be able to give you a better experience overall. You probably don’t want to put yourself in treatment with a new organization who is just figuring it out as they go along. Again, there is a very wide variety of the types of people you’ll find on staff at rehab organizations, and the staff that you work with every day will affect you, your day-to-day mood, and your ability to graduate successfully. If you are at a place with friendly, caring, compassionate staff who practice what they preach, you’re in a good place. If you are at a place with bored, jaded staff who are hypocritical and do the exact things in their private lives that they’re telling you not to do, you’ll struggle to respect them and to get very much out of your treatment. And YES, both types do exist. When you come to EA, you’re coming to a place with a family atmosphere, where the staff is welcoming, competent, and caring, and where you’ll be given thoughtful counsel and advice. Texas, and we are located conveniently close to San Antonio, Austin, Dallas, and Houston. On the other hand, you might need to get out of your typical environment and far away from toxic or dangerous relationships. In that case, you might want to come from out of state, and we have also had many people over the years from all over the United States. The fact that your rehab takes place in a gorgeous, historic Texas mansion is a big draw for many people, and the fact that you’re in a smaller town, away from all the intensity of a big city is a draw for others. We’re glad to offer our residents the opportunity to do things like interact with horses, go to the gym that’s within walking distance, and take trips to town when needed. You’ll get a glimpse of the life that our residents lead when you watch our video. Join us here at Eternal Awakenings for your residential addiction recovery treatment! Start the enrollment process by contacting us today. You’ll be glad you did.